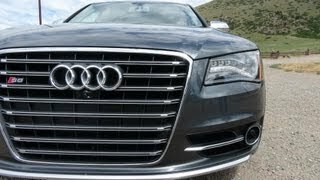 The 2013 Audi S8, which starts in spring 2012 on the market, is the new head of the family of S models from Audi - a large, luxury sedan from a superior force.The new 4.0 TFSI engine delivers nothing less than 382 kW (520 hp); 1700-5500 1/min it puts a constant 650 Nm of torque to the crankshaft. Performance is superior: pass the sprint from zero to 100 km / h only 4.2 seconds at 250 km / h acceleration electronically limited. Even more striking is the consumption, with the content to the sonorous-sophisticated biturbo V8 Pro 100 km there are an average of just 10.2 liters, far less than its competitors.The naturally aspirated 5.2-liter V10 in the previous model, yet allowed himself an average of 13.2 liters per 100 km.Consumption fell by almost 23 percent, with performance significantly by 51 kW (70 hp) increased. Behind the top value of the new Audi S8 are clenched technologies from the modular efficiency platform Audi, including the recuperation and the start-stop system.A particularly important role played by the newly developed "cylinder-on-demand" technology.It switches in the partial load range from four of the eight cylinders - an efficiency increase, which affects particularly strong at moderate highway speeds.A package of acoustically effective measures possible noise and vibration is suppressed, such is the Active Noise Cancellation system. Also, the Eight-speed tiptronic in S8 unites sportiness and efficiency.They use it as much as possible large gears at low speeds, but switched back quickly and extremely convenient when the driver wants it.She leads the forces on a quattro driveline, which combines a self-locking center differential with the sport differential driving the rear axle.With dynamic pace, the forces go primarily to the outside wheel, push the big sedan formally into the curve. The chassis also pulls out all the stops, the new Audi S8. One of its features is the series specially tuned adaptive air suspension.The air suspension with variable damping, which can trim the body on three altitudes, provides the driving experience a wide range.It harmonizes perfectly with the standard onboard dynamic steering, which adjusts their translation at the speed and power assistance.In cornering limit, it stabilizes the vehicle behavior with small, almost imperceptible steering interventions. The driving dynamics system Audi drive select integrates the two systems as well as the engine management system, the eight-speed tiptronic and the sport differential.The driver can determine how these components should work, but the modes comfort, auto, dynamic, individual choice and efficiency. The standard S-specific wheels have the size 9 J x 20, the dimension 265/40 tires.Audi also offers five other wheels, four of them with 21 inches diagonal.The four vented disc brakes have front and rear 365-millimeter diameter 400.Matt black on the front calipers there are adorned with S8 emblems.Alternatively Audi mounted disks made from carbon fiber ceramic that build each more than five kilograms lighter, and its brake calipers are charcoal gray.The ESP has a sport mode in which engine power is determined solely by the accelerator pedal position. A key asset of the S8 is the comparatively low weight of 1,975 kilograms.The body of the luxury sedan produced in the ASF technology (Audi Space Frame) almost entirely of aluminum, only the B-pillars are made ​​of ultra high strength steel.The structure weighs just 231 kilograms - in conventional steel construction it would be about 100 kilograms heavier.Due to the ultra-lightweight construction technology, Audi also on other technology areas, such as the chassis to reduce weight. Delicate design details visualize the special position occupied by the 5.15-meter-long S8 in the Audi model range.The single-frame grille is finished in platinum gray, his eight double struts have a chrome finish.A blade in aluminum finish makes the bumper look sharper in the lateral air inlets sit high gloss black fins and fins in aluminum look. On the sides of the sill trim strips covered in body paint, door handles and mirror housings with aluminum bars in polished aluminum look into the eye.The integrated rear diffuser insert a blade into a double-aluminum finish with contrasting platinum gray parts.The exhaust system discharges into two oval twin tailpipes, which are kept in chrome look. At the front, rear and sides to find or S8-T V8 badges.In the color palette that includes 13 tones that finishes in Daytona Grey and silver prism are reserved for the S8. The interior is fascinated by a quality of workmanship in factory-level and small, powerful accents.The comfort seats are specially designed sport for the S8.They can be adjusted electrically versatile.On request they carry exclusive moon covers in silver with diamond quilting, the stitching and contrasting piping in steel gray.The upper decorative inlay on the instrument panel and the tiptronic selector lever to present the material Carbon Atlas. The multi-function sport leather steering wheel has color-contrasting stitching and also contributes an S8 badge like the instruments.They have, typical of the S models from Audi, gray dials with white needles.This design is also reflected in the classic analog clock.Another eyecatcher is the illuminated door sills with S8 badge.The display of driver information system and the MMI monitor greet the driver with specific S8-screens.The shift paddles and pedals in aluminum look finish, a red ring holds one of the start button. For the interior colors, inlays and upholstery is the S8 provides a wide selection.It reaches to the very soft leather and Valonea to the seats with ventilation and massage function.The leather package, DVD changer, advanced key with sensor-controlled Gepäckraumentriegelung and ambiance lighting package round off the standard interior.In addition, the Audi S8, the innovative LED headlights, and a double glazing on board. 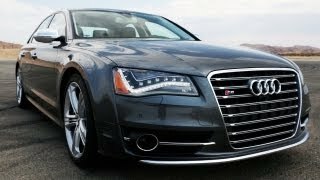 on the rich standard equipment also provides the new Audi S8, every high-end options to choose from out there in the series.Particularly innovative are the driver assistance systems that work in close cooperation with each other and with the navigation system. At its heart is the adaptive cruise control side assist with Stop & Go function, come to the Audi, the Audi lane assist, the speed limit display and the night view assist with marking detected pedestrians. The security system Audi pre sense, available in various stages of development complements these technologies.A new Recommendation identifies break from the steering movements and other parameters, if the driver is tired, and warned him accordingly. New to the A8 family is the parking assistant camera with environment.Four small cameras to capture images of the immediate vicinity of the saloon, a computer, they play together.The driver can call on the MMI display different views, including a virtual view from the top. The system enhances safety when maneuvering in tight and exits - here provide special insight into the views of cross traffic. In the infotainment systems, the standard equipment included in the MMI navigation plus represents the state of technology, it integrates the pioneering MMI touch input system, a large hard drive and a high resolution eight-inch monitor. It brings together high-end system with the likewise standard Bluetooth car phone online special internet services in the car and coupled to mobile devices via wireless.The Bang & Olufsen advanced sound system, with its 1400 watt amp and 19 speakers with fantastic sound fascinating.